Gary Snyder is one of our best nature poets. I think you can see here how Zen Buddhism has influenced him--he treats nature with a reverence. 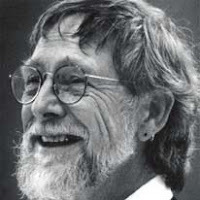 Gary Snyder was born in San Francisco in 1930. He was a member of the beat generation and is a winner of the Pulitzer Prize. He is currently a professor at the University of California at Davis. i love how he tells his story and doesn't just go off on some sappy description of the scenery in an avalanche of similes. Snyder sometimes dates his work by going back to the Neolithic. Ten thousand years is how he thinks. great choice. snyder is the man! I don't know about you but to me the poem speaks about the irony of man's appreciation of beauty/nature and his continued destruction of it. After beautifully describing and immersing the reader in the scenery, he does the reveal: the man is not simply a man but a miner or laborer who is being tasked with digging into and effectively destroying the mountain for the sake of progress. The final line of "Ten Thousand Years" is a way of setting the somber tone. We were shown the beauty of the surroundings and then shown the man is here to destroy it. The ten thousand years gives a sense of how untouched the place is and how easily and rapidly we destroy it. So.. no Zen Buddhism here. Try and look past the surface next time okay?